EAST RUTHERFORD, N.J. (AP) — If the first three preseason games are any indication, the New York Giants are going to have to rely on Eli Manning and the passing game to put up points. The running game just hasn’t been there, and it has nothing to do with No. 2 overall draft pick Saquon Barkley missing the last two games with a mild hamstring injury. While the new revamped offensive line has blocked well for Manning, it is not producing many holes for the running backs. 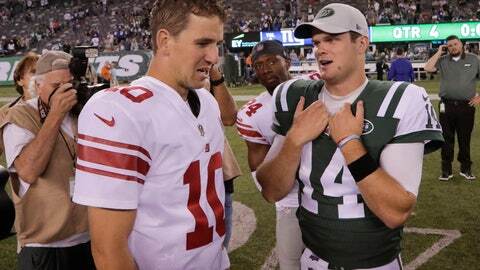 In the 22-16 win over the Jets on Friday night, the Manning and the No. 1 offense played the first half. The two-time Super Bowl MVP was 17 of 23 for 188 yards. The rushing attack had nine attempts for 1 yard. Veteran Jonathan Stewart had three carries for minus 7 yards and lost a fumble on a first-and-goal at the Jets 6. The Giants used a lot of two tight end formations in the first half and coach Pat Shurmur said Saturday that the Jets made it tough on the running game putting extra people near the line of scrimmage. Left tackle Nate Solder, who has was signed as a free agent, said the Jets have a good run defense. One thing that did work was the play-action pass. Manning found Cody Latimer for 54 yards on a play in which the safety bit on a play action, leaving Latimer one on one with the cornerback. If the 37-year-old Manning had led Latimer a little more it would have been a touchdown. Instead, he was tackled at the 6-yard line and Stewart, who has nine carries for minus 5 yards in three games, fumbled on the next play. In the first halves of the past two games, the running attack has gained 16 yards on 20 carries. It’s not the type of production that Shurmur and general manager Dave Gettleman expected after signing Solder and guard Patrick Omameh as free agents and drafting guard Will Hernandez in the second round. They are joined on the line by Jon Halapio at center and former first-round pick Ereck Flowers at right tackle. There is a chance the line needs more time to work things out. The group also may benefit from the production of the passing, especially when Odell Beckham Jr. finally plays in a game and Barkley returns to action. Both should happen in the season opener at home against Jacksonville on Sept. 9. The offense also needs to score touchdowns. The first team accounted for three field goals in the half, while special teams scored a touchdown on a punt return and set up a field goal recovering a kickoff at the Jets 16. NOTES: Shurmur had no update on tight end Evan Engram. He sustained a concussion in the second quarter and is in the concussion protocol. … The blurred eye vision that fellow tight end Rhett Ellison experienced was blamed on a migraine, the coach said. … Second-year placekicker Aldrick Rosas probably retained his job hitting field goals from 48, 40, 27 and 21 yards, while getting touchbacks on his kickoffs.